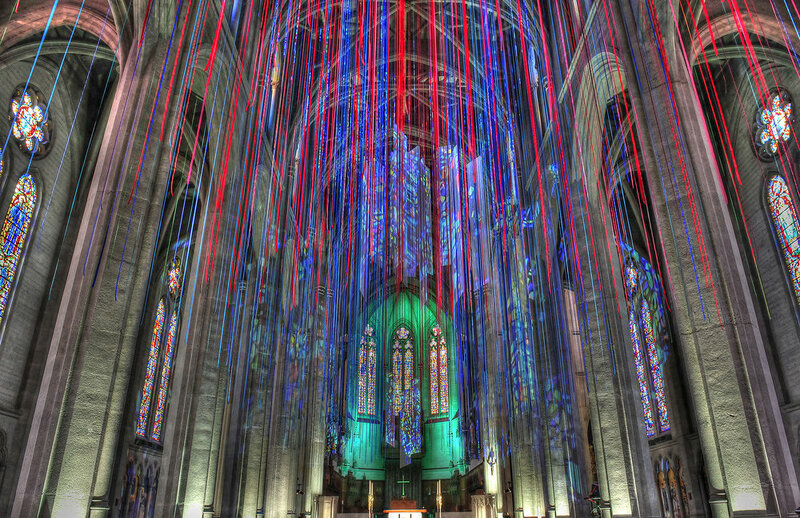 Graced With Light, is a stunning, music-inspired installation that incorporated Grace Cathedral’s vaulted ceiling arches and nearly 20 miles of ribbon. 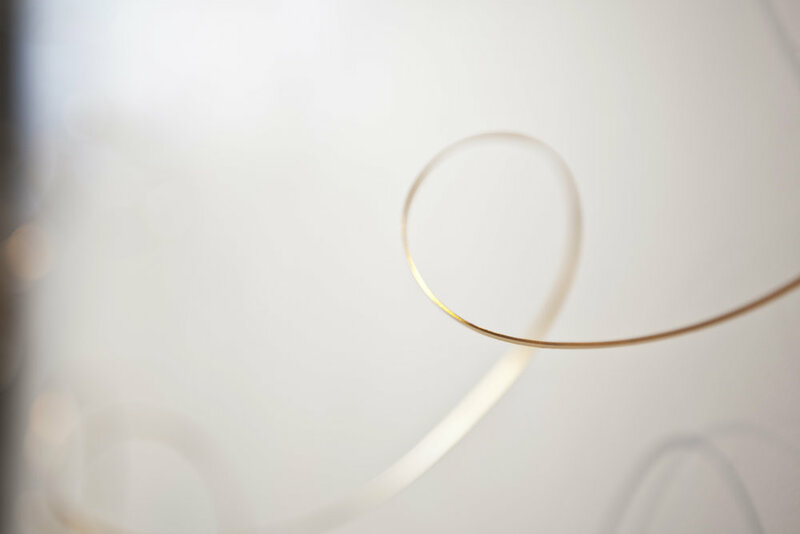 Patterson envisioned a series of light pathways, connecting heaven and earth, manifest as ribbons. 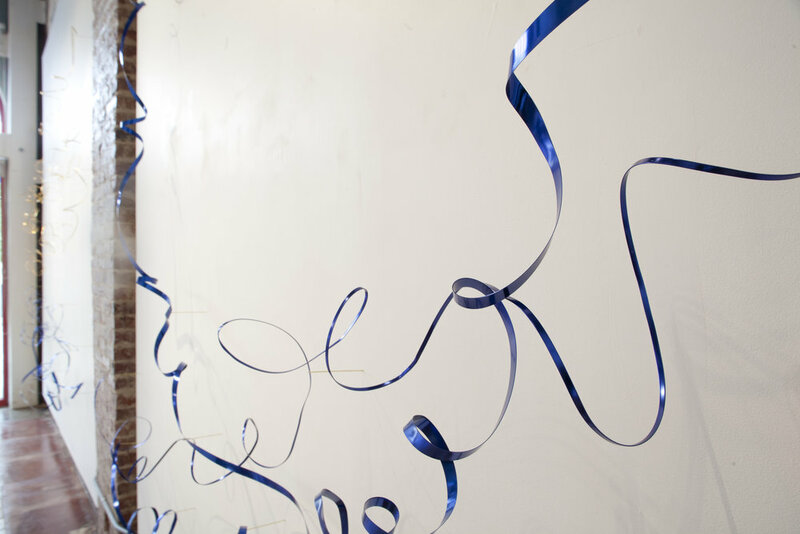 The ribbons carry our prayers, dreams and wishes skyward, and in turn, grace streams down the ribbons to us. The Light Between is a permanent installation in 125 High St Boston. Composed of 7 miles of aluminum ribbon, each strand of metal was shaped by hand before being suspended in the interior skylit atrium. Constructed out of thin aluminum wire, Patterson created The Light Between to heighten the natural light in the manmade space of 125 High Street in Boston. Patterson was commissioned by a private client to create Tandem Dancer. 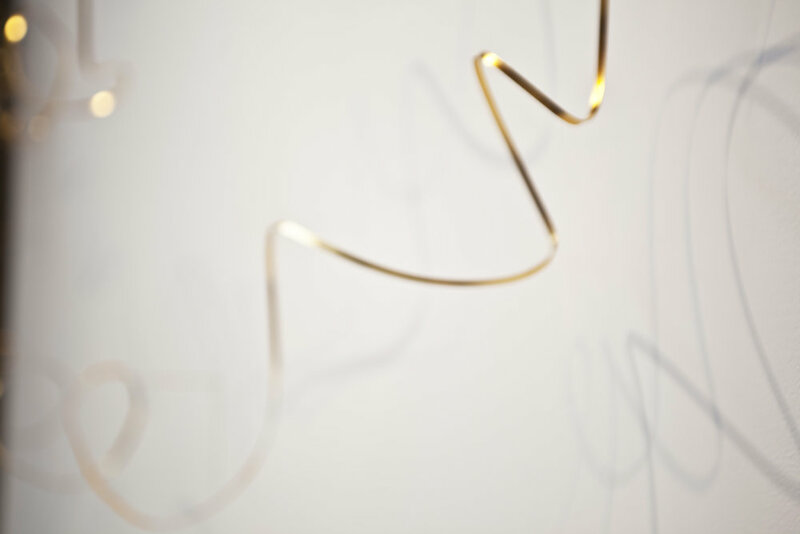 The two strands of wire danced along the wall suspended 5” of the wall’s surface from almost invisible thin brass rods. Inspired by Debussy's "Afternoon of a Faun", Tandem Dancer, mounted on beautiful elm wood, adds movement and reflective light to a long entry hall in a home designed by Platt Dana Architects. 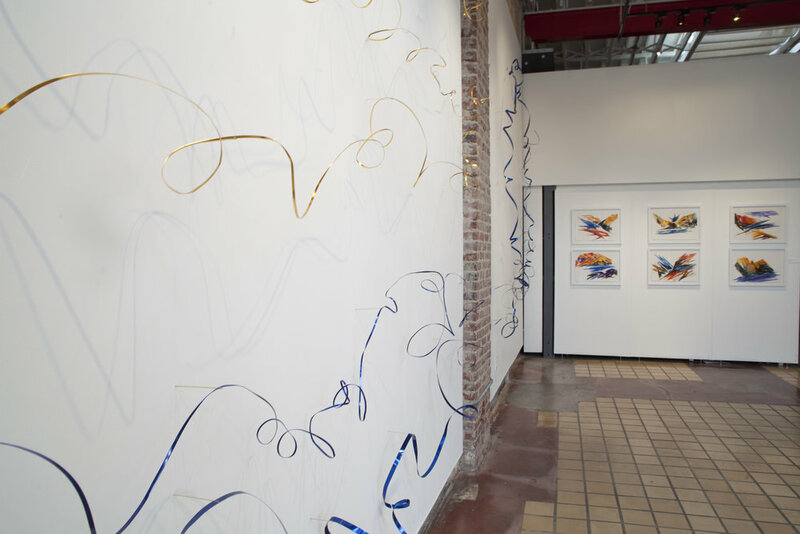 "I envisioned two lines of energy dancing across the wall"
A site specific commissioned installation made for Anne Patterson's solo exhibition, Airidescence at Alfstad& Contemporary, 2016. 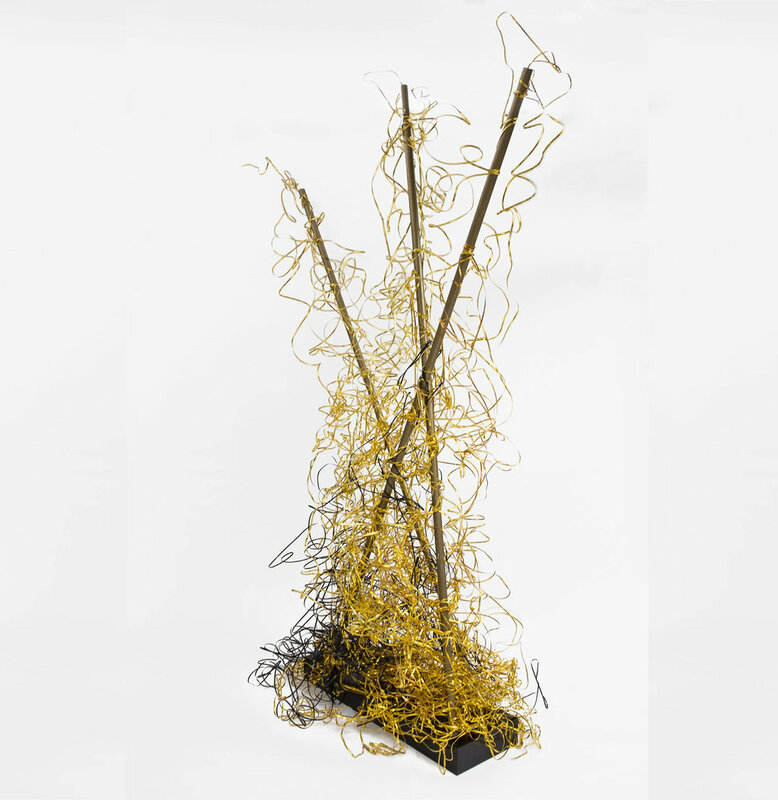 A corporate commission by The Tribune Media Company, Patterson was asked to create a sculpture inspired by Handel’s Messiah. For more information on Anne Patterson's commissioned artwork and theatricals, download the full PDF by clicking Here.